For third straight year, Ingenious Med employees accompany Zambia Medical Mission to provide medical assistance to the underprivileged. 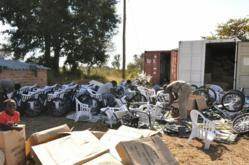 In 2010, Ingenious Med's employees who volunteered with the Zambia Medical Mission assembled wheelchairs that were then given to disabled Zambians. Having our employees personally involved in the medical mission, supported by our financial resources, is very rewarding to our entire team. Employees at Ingenious Med, the nation’s largest multispecialty charge capture and physician rounding platform, are making a trip to the African nation of Zambia as part of the Zambia Medical Mission. For the third consecutive year, several employees at Ingenious Med are accompanying the Mission to Zambia’s southern region, one of the poorest portions of the country. In addition to Ingenious Med’s staffers, who participate individually as volunteers, the company as a whole has donated thousands of dollars to the Zambia Medical Mission, (which is part of the larger Zambia Mission), in order to purchase medical supplies. The group will be heading to Zambia in July for two-and-a-half weeks, offering medical assistance. All told, the Zambia Medical Mission will take some 250 volunteers who expect to assist nearly 20,000 Zambians during this trip. Last year, some of the money donated by Ingenious Med went toward purchasing parts for bush-adapted wheelchairs, which were then given to the disabled population. According to 2011 UNICEF statistics, 12.5 percent of Zambia’s population has HIV, and the life expectancy for Zambians is 49 years. In 2009, 690,000 children in Zambia were orphaned due to AIDS. Ingenious Med’s flagship platform, the award-winning impower software, allows physicians to use both the web and mobile devices to perform point-of-care charge capture for both inpatient and outpatient services. The cloud-based solution provides real-time data that can boost physician efficiency, enhance quality of care and increase billing accuracy. The Zambia Medical Mission, a project of the Church of Christ’s Zambia Mission, has been in existence since the 1920s. The Abilene, Texas-based group provides medical assistance to underprivileged Zambians in the impoverished southern region of the country. Those interested in getting involved with the mission should visit the Zambia Medical Mission’s Get Involved page on its website. Founded in 1999 by a group of practicing physicians, Ingenious Med is an award-winning point of care platform that automates the activities of 25,000 inpatient and outpatient physician in the nation’s leading healthcare facilities. The mobile and cloud-based charge capture and analytics platform provides real-time data that helps hospital systems and physician groups improve physician productivity and efficiency, enhance quality of care, maximize revenue, increase billing accuracy and ensure compliance. For more information, visit http://www.ingeniousmed.com or call 404-815-0862.